Dr. Christian Legler, left, is presented with an Association of Teacher Educators Clinical Fellows award at the 2018 ATE meeting in Las Vegas. Dr. Legler was one of eight teacher educators selected nationally to participate in the highly competitive 2018 ATE Emerging Scholars program. 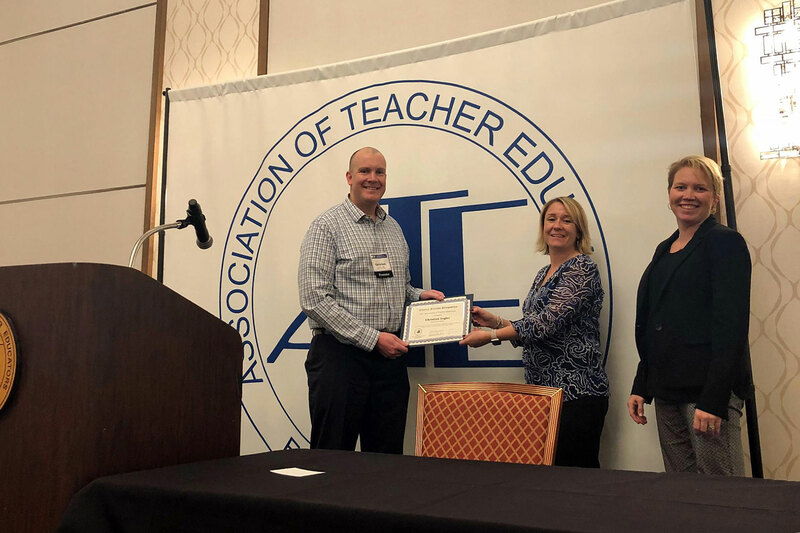 Dr. Christian Legler, assistant professor in the School of Education and Counseling, was recently honored at the 2018 Association of Teacher Educators (ATE) annual meeting in Las Vegas. He was one of eight teacher educators selected nationally to participate in the highly competitive 2018 ATE Emerging Scholars program. Legler looks forward to applying what he learned at the symposium to enhance clinical practice in the Educational Foundations and Leadership Department at Wayne State. Before becoming a college professor, Legler worked in the non-profit sector for eight years. He then changed careers and became a high school science and social studies teacher in Jacksonville, Fla., teaching for eight years. In 2013, he began working on his doctoral degree at the University of Florida, specializing in curriculum, teaching, and teacher education because of his aspirations to prepare future teachers. After completing his doctorate, Legler began teaching at Wayne State in August 2017. Dr. Nicholas Shudak, dean of the School of Education and Counseling at WSC, praised Legler’s work as part of Wayne State’s highly renowned education program. “Dr. Legler’s work and interests are valued and help continue the storied tradition at Wayne State College of preparing excellent teachers and leaders in schools and communities,” said Shudak.